After bang trim., originally uploaded by sylviecola(trying to catch up.). Here is my latest commission I finished. She was a Piccadilly Encore and her owner wanted her to have new hair and new make-up. I gave her a high color palette. Hard to believe she was a PiccaE. Well, I’ve been doing a lot of thinking and I have decided that I won’t be accepting any new commissions for a while. I continue to get further and further behind and put off my own personal projects or I feel guilty when I take time to work on personal projects. Initially, I kept thinking once I finished with all the commissions, then I could work on my own creations. It seems that I always had some coming in which I’m grateful for. However, as an artist I always want to try new things and explore different possibilities so I have to accept my limitations and there are only so many hours in the day. I will finish everyone on my list and once those are done I will be closed for any new commissions indefinitely. It makes me a little sad but it’s been long overdue. I plan to practice more sewing and coming up with designs to dress my future ooak Blythes. Maybe I’ll get back into painting. Maybe I’ll try something completely new. Maybe I’ll be able to write more and keep up with this blog and getting better at photography. Whatever it is, it will be something creative and hopefully open new possibilities. 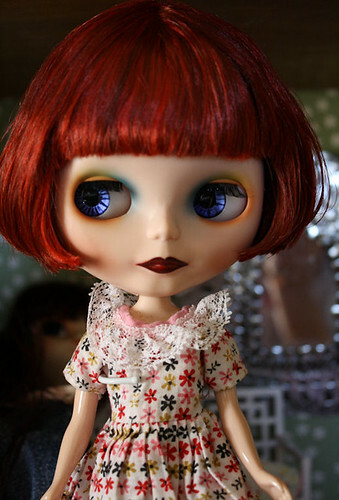 This entry was posted on March 29, 2010 at 8:04 pm and is filed under blythe, Custom Dollies, Dolls, reroots. You can subscribe via RSS 2.0 feed to this post's comments. Love this dolly! She’s got a real personality and charm!